In 2016, with the help of the Soolnua agency, the Bratislava Convention Bureau developed a new branding strategy, linked by the slogan “Surprisingly Close | Exceptionally Smart”. In a very short period of time, the brand got on well on the international market and the responses from the professional public were extremely positive. The second part of the slogan “Exceptionally Smart” embodies the Slovak exceptional ability in doing things well and differently, which nowadays is predominantly used in the automotive industry, the fastest growing part of the Slovak economy. In the framework of rebranding, the project Bratislava Motor City was created, which, through content marketing as well as through direct marketing, addresses the target group of organizers of moto events. The Business meetings in Bratislava are focusing on the know-how exchange that could lead to a more sustainable car industry and innovations. The general developmental focus is a green and sustainable way of doing business. The highlight of the campaign was the organization of the familiarization trip at the end of September which was attended by the representatives of seven specialized agencies from Europe. The program was prepared and carried out by the energetic team of Bratislava CVB in cooperation with Emerge Agency and the consulting companies Soolnua and Toleranca marketing. An attractive program was accompanied by friendly weather and summer temperatures. The base for exploring the city was the Grand Hotel River Park, where we also had a site inspection at the beginning of the first day of the program. The hotel’s entire infrastructure allows for the organization of the most demanding events, and logistics is also made easier with a huge underground car park. The great advantage of the hotel is the photogenic external surfaces and the clean architecture, where it is possible to organize part of the events, and the location is also perfect for organizing photoshoots of cars. What came next was the tour of the city with a nice old-timer bus called Preshporacik. 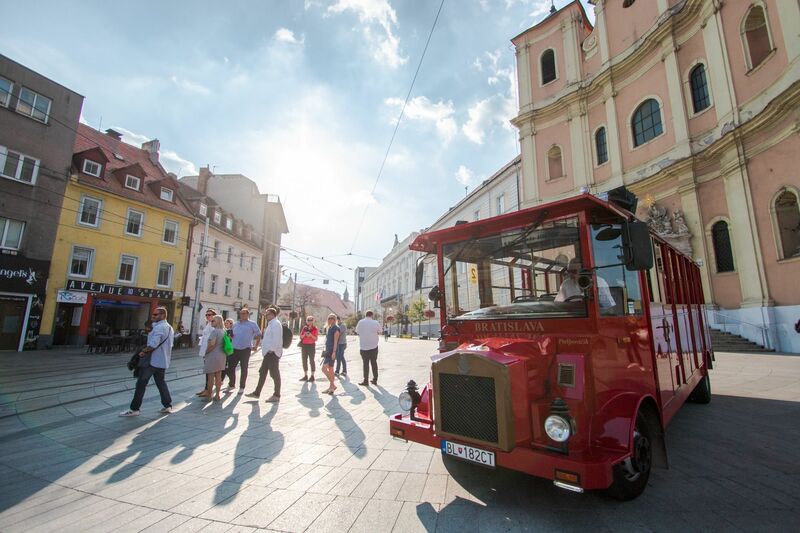 A drive through the city with an open rooftop bus was a special experience, rounded up with a walk in the company of a guide along the old part of the city and a quick hike to the beautifully decorated Bratislava Castle. The participants were surprised by the compactness of the city center and many special venues such as the atrium of the Museum of the City History, a top notch garden in Neo-Gothic style. There are quite a few such venues and they definitely represent the competitive advantage of the city. The second day was reserved for more action and was entirely devoted to discovering the possibilities for car launch events. We started the day on the Slovakia Ring, which awaited us in a true motorist atmosphere. On the racetrack there was a practice run going on for a motorcycle race, which gave the octane lovers a real experience of the sound and smell of gasoline. The Slovakia Ring is located about 40 kilometers from Bratislava and is famous for its safety and its width, which enables various types of competitions. It is possible to rent race cars and also to privately rent the racetrack for various car events. The participants also tested a safe driving ride where the instructor simulated a ride on an iced track. There are not many cities in Europe that have this kind of infrastructure, giving Bratislava an advantage in the field of organizing automotive events. A visit to the x-bionic® sphere Sphere multifunctional center was next on the list. The participants were very enthusiastic about the business and sports resort X-Bionic Sphere where you can prepare for and compete in 27 Olympic sports. You can also conduct top business meetings as the center offers excellent conditions for the most demanding events and congresses and is located only a mere 20 kilometers from Bratislava. With the x-bionic® sphere Bratislava gained an important place for business events and a completely new concept, a kind of hybrid between a sports center, a hotel resort and a prestigious congress center. The complex currently has 282 hotel rooms. The Congress Center includes 12 congress halls (the largest one accommodating up to 600 participants and has a surprisingly high ceiling), and is suitable for the most demanding production of events. Organizers also love many outdoor areas, zen atriums and corners which can be used for parts of the event if the weather is good. As the facility is located right next to the Danube, the participants can travel to the picturesque location of the Danubiana Meulensteen Art Museum by boat. In this part, the Danube resembles a lake more than a river, and the gallery itself is situated on the peninsula in the middle of the river. It was founded by the Dutch collector and patron of art Gerard Meulensteen and the Slovakian artist Vincent Polakovič. Since its opening, the museum has hosted numerous automotive and other events. The unique location is a great attraction of the park. The artistic value and tranquility amidst beautiful nature just outside of Bratislava are a great advantage. It is therefore not surprising that the park has become the new icon among the event organizers. The afternoon part of the program was marked by a visit to the Volkswagen factory in the suburbs of Bratislava. It was opened in 1991 and started with the mass production of the VW Passat Variant. Volkswagen Touareg, Audi Q7, Volkswagen Up!, Škoda Citigo, SEAT Mii and Porsche. It is also the only factory where there are 5 different brands produced under the same roof. The grand finale of the event was the dinner at the famous UFO restaurant. It is located on the New Bridge, and its shape makes it the true mascot of Bratislava. Bratislava has proven itself as a city perfect for hosting automotive events. Among the advantages that the participants have come to know and test on their own is the easy accessibility and the fact that it has everything and more in comparison to bigger and much more notorious competitors. If we express ourselves in the automotive language, the hardware and software in Bratislava are perfectly coordinated with each other, which we have thoroughly tested. After two days of socializing, it became clear that this is an above-average destination, waiting to be discovered by even the most demanding international event organizers. 129,000 People employed directly by the 3 car producers — VW, PSA, Kia & Tier 1 suppliers. 250,000 People employed directly & indirectly by the automotive industry. 44% Share of the automotive industry of the country’s total industrial production. 192 Taking into consideration the number of inhabitants, Slovakia is by far the global leader in car production per 1000 inhabitants.